Oxygen users know all to well how important it is to have a portable oxygen system they can count on. You shouldn't ever have to experience the pang of anxiety felt when the system goes down without warning. The Respironics Simply Go features the best that technology has to offer with audible alerts in the case of power outage, no breath detected alarms, and oxygen purity checks. Should your oxygen level fall below required purity levels you will be notified. Never wonder about the quality of your care with Simply Go Portable Oxygen Concentrators. 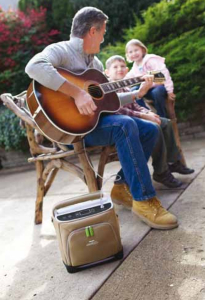 This Respironics Simply Go portable oxygen concentrator is compatible with high-powered lithium batteries. Weighing just one and a half pounds, these batteries can power your oxygen concentrator for up to 3 and half hours when using pulse dose setting. On continuous flow setting you can expect a little less than an hour of operating time. Your battery is conveniently included in your purchase, so you will be ready to hit the road when you receive your oxygen concentrator by Respironics. Attractive Design: With a modern, sleek appearance, your oxygen concentrator lacks the clinical look. User Friendly Interface: Strategically planned to accommodate users of all ages and demographics, the interface system can be operated by just about anyone. Reliability with a focus on safety: Featuring alerts that will allow you to relax, this system is designed with safety as a top priority. Socialize with friends, or take a hike, and enjoy the reassurance of knowing that your oxygen concentrator is as reliable as it is functional. Reviewers Tip: An International Power Adapter is necessary if you plan to travel out of the country. The permanent internal bacteria filter should last a lifetime for the normal use of the machine. Truly take the SimplyGo everywhere you go! Can you use your SimplyGo in different elevation levels? Yes, this system fully operates in altitudes up to 10,000 feet above sea level. Enjoy travel stress free with the knowledge that your system will adapt to such changes in elevation. How can I transport my system? The SimplyGo conveniently comes with a carrying bag, allowing you to easily maneuver your machine without having to awkwardly grasp it during transportation. Respironics EverGo Portable Oxygen Concentrator is a lightweight device meant for travel. The look of each is unique, therefore the best way to determine which is best for you is to go by your personal style. Both machines operate efficiently, and are equipped with safety features.